ESSEBI is integrating MonoDAQ-E-gMeter triaxial MEMS accelerometers in permanent bridge monitoring systems. Due to permanent monitoring requirements on many measurement points accross the structure, the affordability of such a solution is extremely important. MEMS technology turns out to be mature enough at this point and an ideal choice for the demanding application. 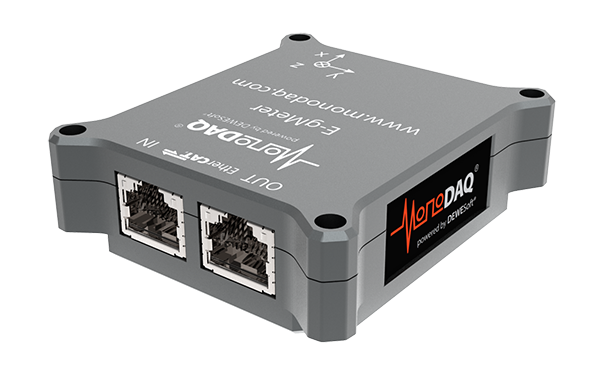 MonoDAQ-E-gMeter builds on the flexibility of the MonoDAQ-E product line (EtherCAT connectivity, 50 m module-to-module distance, single network cable, up to 48 V power supply, DEWESoft software) and includes a triaxial low-noise precision MEMS accelerometer that is comparable in performance to the special seismic accelerometers. Structural health monitoring is an ongoing process of monitoring the mechanical state of structures. Disasters such as Genoa bridge collapse can be prevented using permanent stuctural health monitoring systems.